I am extremely pleased to read that Pope Benedict XVI has called for Vatican Judges to tighten up the criteria in granting annulments. This follows a report that states 69 annulments were granted in 2005 for truly insufficient reasons including husbands being too attached to their mothers! For those new to the term, an "annulment" is declaring a marriage null and void. Additional information can be found on Wikipedia. In the Gospel of St. Luke 16:18, Christ tells us that anyone who puts away his wife and marries another, commits adultery! Unfortunately, the number of annulments from 1952 to 1956 number 359 worldwide. Following Vatican II in 1968, there were 450 in the US alone! In 1997, there were more than 73,000 annulments worldwide! This is outrageous! Today is the Feastday of St. John Bosco. I strongly encourage people to read about his life and the miracles he worked. His dreams are truly inspiring. Read my post from last year. "I have no desire except to die or to love God; either death or love, since life without this love is worse than death and for me it would be more unbearable than it is at present." "It should be observed that perfect love of God consists not in those delights, tears, and sentiments of devotion that we generally seek, but in a strong determination and keen desire to please God in all things, and to promote His glory." The Vatican has a Court System? Did you know that the Vatican has it's own ecclessial court system? It does. 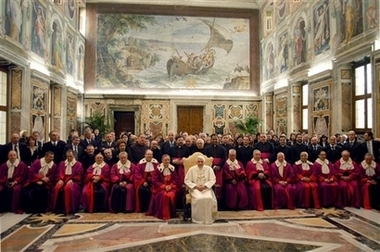 This recent photo is of Pope Benedict XVI with the Sacra Rota Romama, the second highest court. The only court that is higher is the Apostolic Signatura. Bendigo Cathedral will stay the way it is! THE internal layout of the Sacred Heart Cathedral will not be altered.Head of the Sandhurst Diocese, Bishop Joe Grech, has no plans to move the altar from the sanctuary to the area in front of the pews, nor remove the altar rails. However, he said the idea was raised during a discussion on how to encourage a closer relationship between the clergy and parishioners. "At the cathedral parish, we are always looking at how we can do things a bit better, how we can involve people in what we do," he said." We said maybe we need to do something about the altar because it still feels as if there’s a gap between the people and the sanctuary." You talk about these things, part of our mission is how to get closer." But the structure itself of the cathedral is what we have at the moment, we will work with that and that’s the important thing." If the idea was on the agenda, Bishop Grech said he would have discussed such a move with his parishioners." If there were plans, I would have done it different, I would have presented it to the people for debate firstly, for discussion," he said." You have ideas about so many things in life and then you come to make a decision, you see whether it’s practical, or good or not so good and you work that way." Suggested changes to the altar have prompted a heated community debate between traditional Catholics and those who support change. The debate has centred on liturgical and historical arguments, along with sentiment and emotion. Bishop Grech believes every person is entitled to express their beliefs on any issue, but urges others to remember that regardless of the issue, there is a need for sensitivity. "Any change is difficult," Bishop Grech said. "Some people feel with change there is a loss of something, that’s why you have to be sensitive, you have to be practical in life." It’s good for people to have freedom to think and be able to express it." Faith is something of the heart." Fr. Robert Drinan, 86, the first Catholic priest to become a voting member of Congress, has died. He was an example of what a priest should not represent. Not only did he support contraception, but he also strongly supported the horror of abortion! What a scandelous man, who was supposed to be serving the Flock of Jesus Christ! He even openly supported Clinton's veto of the Partial-Birth Abortion Ban Act. A priest is called to lay down his life so that others may have life. However, Fr. Drinan supported the murder of millions of innocent, unborn children. He is a disgrace to the Holy Catholic Church. 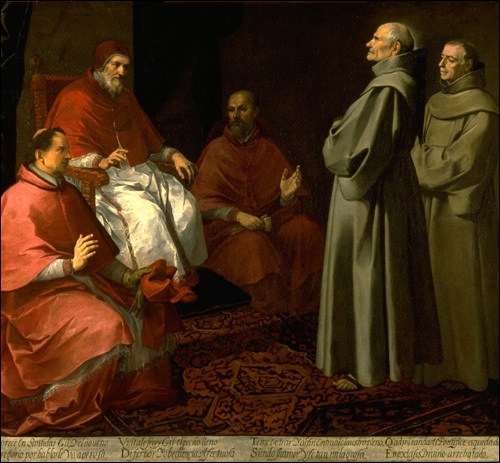 Saint John Chrysostom said: "Few bishops are saved and many priests are damned". Let's pray for the soul of Fr. Drinan; may he have repented from his grave errors before his death. "Go to the market, buy a chicken, and pluck it on your way back here, scattering the feathers as you walk. When you give me the plucked chicken, I'll tell you the rest of your penance." The woman was baffled did as she was told. After she handed the plucked chicken to the saint, St. Neri said, "Now that you've spread those feathers about, go pick them up." "But, Father! It's impossible to know where they've all gone!" "Just like the words of your gossip," he said. I'd like to share an excerpt of Fr. 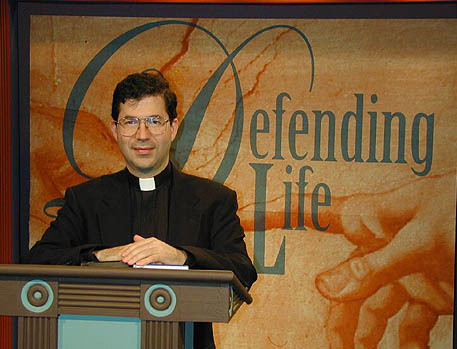 Frank Pavone's Homily from Thursday, Week II, in Ordinary Time. There’s one way to peace in the world. Jesus Christ our High Priest is our peace. Peace is not simply when bombs stop being dropped or guns cease their fire. Or troops are withdrawn. Neither is peace identical with troops being deployed. It is beyond all that. Peace comes when we are reconciled with Almighty God. And when through that reconciliation, we respect the human rights and dignity — the inherent human rights and dignity, of every person. That is when peace comes. Peace is not lost when the first gun is fired or the first bomb is dropped or the first tank rolls in. That is not when peace is lost. Peace is lost whenever an injustice is committed against a human being. That is when peace is lost. It can happen in the quiet silence of an apparently peaceful city. But if human lives in any way are being oppressed or downtrodden, peace has already been lost. Lets not have a superficial understanding of what peace is or what the way to peace might be. CHICAGO, January 26, 2007 (LifeSiteNews.com) - Last Friday, a ruling was handed down from the Northern Illinois District Court allowing the pro-adoption message "Choose Life" to be an option for specialty license plates in the State of Illinois. Citing First Amendment protection, Judge David Coar ruled in favor of Choose Life Illinois (CLI), explaining that their message is constitutionally entitled to be on Illinois license plates. In Judge Coar's Memorandum it states that "…the Secretary of State is ordered to issue the 'Choose Life' plates." CLI, a pro-adoption organization, had filed the lawsuit against the Secretary of State, Jesse White, claiming that the process by which the "Choose Life" specialty license plate was disapproved in Illinois was "viewpoint discriminatory" in violation of the First Amendment and, therefore, unconstitutional. CLI also stated that certain members of the Illinois General Assembly had demonstrated anti-adoption prejudice during the last two legislative sessions by placing political roadblocks in the way of a bill that would have added the "Choose Life" specialty license plate to the 60 specialty plate options currently available to Illinois citizens. As the official website for Choose Life Plates in Illinois states, Choose Life Plates are coming to Illinois! 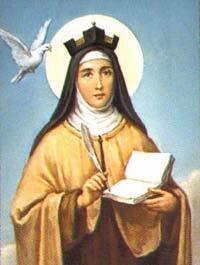 This is a video of Sr. Julia of the Daughters of St. Paul, who is recommending books for Lent. With Lent only three weeks away, it's time to start thinking about Lent. Not only should we fast, abstain, and give up something during Lent, but also we should do spiritual reading. I also must suggest a reading program I found that is set up so that participants, after the 40 days of Lent, will have read 10 Church Father's writings. See their site for more information (pdf). 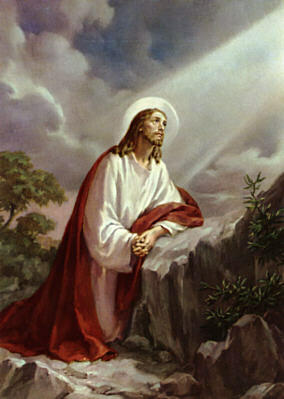 The Dolorous Passion of Our Lord Jesus Christ by Blessed Anne Catherine Emmerich. "We need to bring prayer into our family life. Through prayer, we will be able to teach our children and relatives to share. We will gain more through genuine prayer than with mere words." St. Timothy was not only a co-worker and companion to St. Paul but also his spiritual son. St. Timothy was converted and baptized into the True Faith during St. Paul's first missionary journey, and St. Timothy was later ordained a priest at a young age by St. Paul. 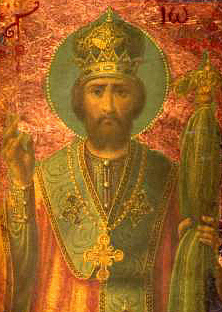 St. Timothy eventually became the Bishop of Ephesus when St. Paul consecrated him thus. It was 30 years after St. Paul's martyrdom that St. Timothy followed his friend in martyrdom - St. Timothy was stoned to death. St. Titus was a fellow companion of St. Paul on apostolic missions. He was a convert from paganism and later served the Church as Bishop of Crete. It proved to be a difficult responsibility because of the inhabitants and spread of erroneous doctrines on the island of Crete. St. Paul's writings tell us that St. Titus rejoiced in the good in others and drew the hearts of men by his affectionate sympathy. At the age of 94, St. Titus died of natural causes. He lived in the state of virginity his entire life. Look down upon our weakness, almighty God; and since the weight of our own deeds bears us down, may the glorious intercession of Blessed Timothy, Thy Bishop and Martyr, protect us. Through our Lord. O God, Who didst adorn blessed Titus, Thy Confessor and Bishop, with apostolic virtues: grant by his merits and intercession that a life of duty and justice here below may win for us our heavenly home. Through our Lord. 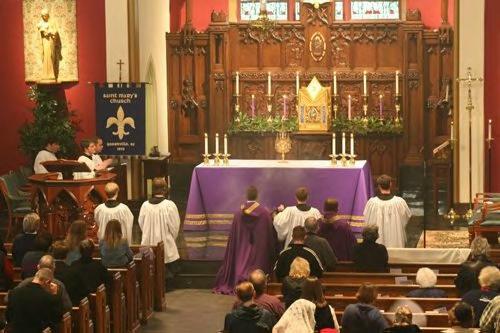 Mass in Latin is no longer a memory relegated to Lafayette Roman Catholic Diocese annals. Latin Masses returned to the Lafayette Roman Catholic Diocese on Jan. 14, when the Rev. Jerome Frey celebrated the initial Latin Tridentine service at St. Peter Church. Beginning Feb. 4, the services will be offered at 1 p.m. on the first Sunday of each month at the church located at 102 N. Church St. Previously, Catholics who preferred the Latin service had to drive nearly 60 miles, or about an hour, to St. Agnes Catholic Church in Baton Rouge. The Baton Rouge Diocese church conducts the service at 9:30 a.m. each Sunday. Wonderful! 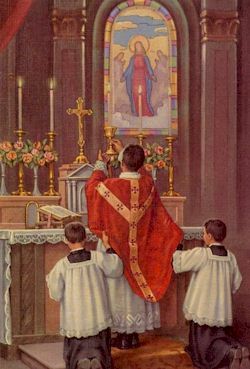 It's great to see the Traditional Latin Mass spreading! I came across an uplifting article on Catholicism in Tibet. Although the man in the story says that he only sees a priest once a year, he says that the faith of Catholics remains alive. Today is the Feast of the Conversion of St. Paul. See my post from last year for a reflection on today. Whenever I go to the chapel, I put myself in the presence of our good Lord, and I say to him, 'Lord, I am here. Tell me what you would have me to do ' . . . . And then, I tell God everything that is in my heart. I tell him about my pains and my joys, and then I listen. If you listen, God will also speak to you, for with the good Lord, you have to both speak and listen. 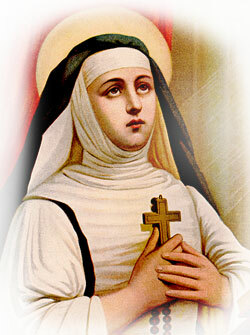 God always speaks to you when you approach him plainly and simply" (St. Catherine Laboure). Today is a Day of Penance for all of the dioceses of the USA for violations to the dignity of the human person committed through acts of abortion. Liturgically, today the Church remembers St. Vincent of Saragossa, also called St. Vincent the Deacon or Vincent of Aragon. 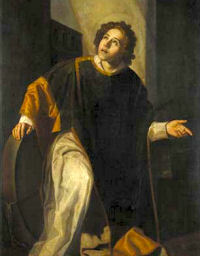 He is considered one of the three most illustrious deacons of the Church - the others being St. Stephen and St. Lawrence. Ordained deacon by Bishop Valerius of Saragossa, he was taken in chains to Valencia during the Diocletian persecution and put to death. From legend we have the following details of his martyrdom. After brutal scourging in the presence of many witnesses, he was stretched on the rack; but neither torture nor blandishments nor threats could undermine the strength and courage of his faith. Next, he was cast on a heated grating, lacerated with iron hooks, and seared with hot metal plates. Then he was returned to prison, where the floor was heavily strewn with pieces of broken glass. A heavenly brightness flooded the entire dungeon, filling all who saw it with greatest awe. After this he was placed on a soft bed in the hope that lenient treatment would induce apostasy, since torture had proven ineffective. But strengthened by faith in Christ Jesus and the hope of everlasting life, Vincent maintained an invincible spirit and overcame all efforts, whether by fire, sword, rack, or torture to induce defection. He persevered to the end and gained the heavenly crown of martyrdom. O Lord, listen to our supplications: that we who acknowledge the guilt of our sins, may be delivered through the intercession of Thy blessed Martyrs Vincent and Anastasius. Through our Lord. 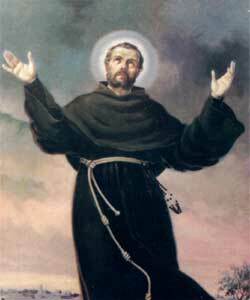 Today is a somber anniversary - a day that I encourage penance, abstience, and fasting. Today is the 34th anniversary of the Roe v. Wade Abortion Case, which legalized abortion in the United States by overriding all state abortion laws. We must repent of these sins and do penance in reparation! And we must work for the end to abortion. Please see my post on Pro-life actions that can be done all throughout the year. The March for Life is going on right now in Washington, D.C. and many colleges including St. John Vianney Seminary are there. Today is also a day of abstience! 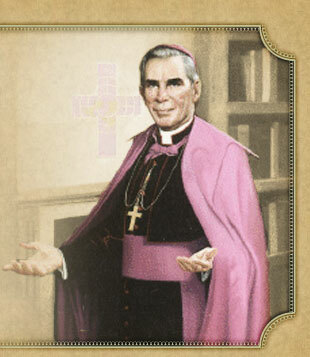 Cardinal William Keeler responded, when asked if abstaining from meat was required: "It is not asked, but obliged by all the faithful under Church law. This time it cannot be substituted with acts of charity or service, while on Fridays it can. I hope the pastors informed their parishoners of this from the pulpit last Sunday!..." 2271. "Since the first century the Church has affirmed the moral evil of every procured abortion. This teaching has not changed and remains unchangeable. Direct abortion, that is to say, abortion willed either as an end or a means, is gravely contrary to the moral law: You shall not kill the embryo by abortion and shall not cause the newborn to perish. [Didache 2, 2: SCh 248, 148; cf. Ep. Barnabae 19, 5: PG 2, 777; Ad Diognetum 5, 6: PG 2, 1173; Tertullian, Apol. 9: PL 1, 319-320.] God, the Lord of life, has entrusted to men the noble mission of safeguarding life, and men must carry it out in a manner worthy of themselves. Life must be protected with the utmost care from the moment of conception: abortion and infanticide are abominable crimes. [GS 51 # 3.]" 2272. "Formal cooperation in an abortion constitutes a grave offense. The Church attaches the canonical penalty of excommunication to this crime against human life. 'A person who procures a completed abortion incurs excommunication latae sententiae,' [CIC, can. 1398.] 'by the very commission of the offense,' [CIC, can. 1314.] and subject to the conditions provided by Canon Law. [Cf. CIC, cann. 1323-1324.] The Church does not thereby intend to restrict the scope of mercy. Rather, she makes clear the gravity of the crime committed, the irreparable harm done to the innocent who is put to death, as well as to the parents and the whole of society." 2274. "Since it must be treated from conception as a person, the embryo must be defended in its integrity, cared for, and healed, as far as possible, like any other human being. Prenatal diagnosis is morally licit, 'if it respects the life and integrity of the embryo and the human fetus and is directed toward its safe guarding or healing as an individual.... It is gravely opposed to the moral law when this is done with the thought of possibly inducing an abortion, depending upon the results: a diagnosis must not be the equivalent of a death sentence.' [CDF, Donum vitae I, 2.]" 2322. "From its conception, the child has the right to life. Direct abortion, that is, abortion willed as an end or as a means, is a 'criminal' practice (GS 27 # 3), gravely contrary to the moral law. The Church imposes the canonical penalty of excommunication for this crime against human life." YOU CAN'T BE CATHOLIC AND SUPPORT ABORTION IN ANY CASE! Pro-life Actions that you can do this year! I'm creating a list of those ways that we as pro-life Catholics can stand up for life this year. Please help me by spreading word of this list and letting me know what addition items to add to the list. Don't support Save lids to save lives, the March of Dimes, or UNICEF which support abortion. See #3 for an extensive list of "charities" that support abortion. From January 18 - January 25, 2007, we celebrate the Week of Prayer for Christian Unity, of which I have already posted a prayer. However, I feel that instruction is needed for the faithful during this week. It would be extremely easy to fall into error this week while seeking unity. We as Catholics follow the complete Truth of Jesus Christ revealed over the past 2,000 years. And that is what we will always believe. We shall not - must not - disregard a single teaching of the Church for "unity". Unity does not mean that all of the separated Christians should come together and make compromises until a new Creed is made. This is heresy! We will not compromise one single article of doctrine, or one single dogma, or one single practice of our faith. For that is a common misconception of what this Week of Christian Unity is about. This week of Christian Unity is about praying for fellow non-Catholics to repent for their sins and enter into the Catholic Church - completely obedient to the Magesterium and all honored Traditions of the Faith. Yes, it is a sin to refuse to believe a single dogma of the Church. And, it may compromise one's soul if that person refuses to believe even one part of the Faith taught by Christ and revealed through the years by the Holy Catholic Church. Again, anyone who will disregard a dogma or teaching of the Holy Church in the name of ecumenism will surely answer to Almighty God. 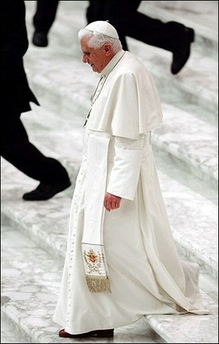 The Church is our Mother and led by the Successor of Saint Peter - the Pope. I have already posted a summary of some of the Church's teachings in my post on the Prayer for Unity. And, since we still hold the True Faith, it is our obligation to pray for non-Catholics to see their errors and enter the Church. In truth, interdenominational activity has been condemned through the years by the Church. I have not and will not attend a single Protestant service, and I hope and pray all Catholics will do the same. This is not because I view myself superior. After all, Jesus ate with the sinners and was criticized for it. But, it is a scandelous activity to attend a Protestant service. Not only do Protestants not have the authentic Sacraments like the Eucharist, Confession, Last Rites, Holy Orders, etc., they believe heresy. The very word "Protestant" implies they are "protesting". And what are they protesting against? They protest against the Catholic Church, which is the Sacrament of salvation for the whole world! For this reason, it is wrong for any Catholic to attend a non-Catholic religious service. The 1962 Roman Catholic Daily Missal (Angelus Press Edition) states that it is a sin to "go to places of worship belonging to other denominations" (page 66). "...it will be opportune to expound and to reject a certain false opinion which lies at the root of this question and of that complex movement by which non-Catholics seek to bring about the union of Christian Churches. Those who favor this view constantly quote the words of Christ, "That they may be one (Ut unum sint)... And there shall be one fold and one shepherd" (John xvii. 21, x. 16), in the sense that Christ thereby merely expressed a desire or a prayer which as yet has not been granted. For they hold that the unity of faith and government which is a note of the one true Church of Christ has up to the present time hardly ever existed, and does not exist today. They consider that this unity is indeed to be desired and may even, by cooperation and good will, be actually attained, but that meanwhile it must be regarded as a mere ideal. 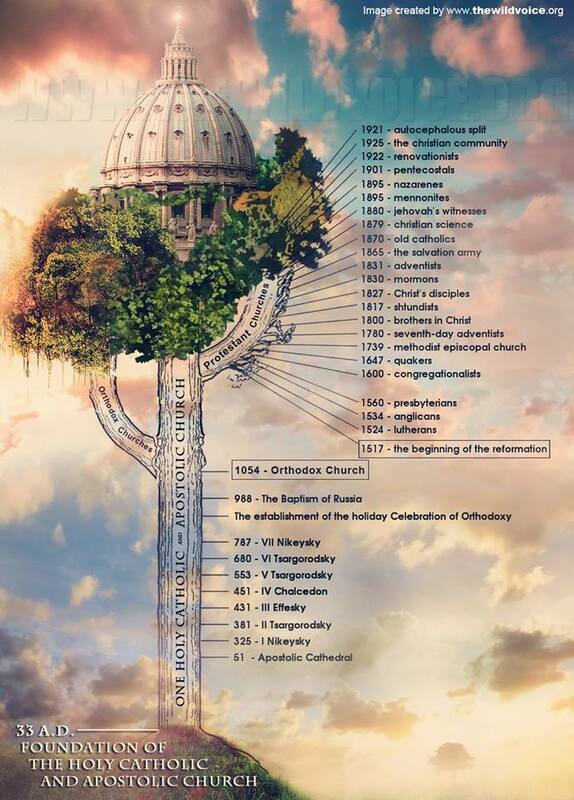 The Church, they say, is of its nature divided into sections, composed of several churches or distinct communities which still remain separate, and although holding in common some articles of doctrine, nevertheless differ concerning the remainder; that all these enjoy the same rights; and that the Church remained one and undivided at the most only from the Apostolic age until the first Ecumenical Councils. Hence, they say, controversies and long-standing differences, which today still keep asunder the members of the Christian family, must be entirely set aside, and from the residue of doctrines a common form of faith drawn up and proposed for belief, in the profession of which all may not only know but also feel themselves to be brethren. If the various Churches or communities were united in some kind of universal federation, they would then be in a position to oppose resolutely and successfully the progress of irreligion. "Such, Venerable Brethren, is the common contention. There are indeed some who recognize and affirm that Protestantism has with inconsiderate zeal rejected certain articles of faith and external ceremonies which are in fact useful and attractive, and which the Roman Church still retains. But they immediately go on to say that the Roman Church, too, has erred, and corrupted the primitive religion by adding to it and proposing for belief doctrines not only alien to the Gospel but contrary to its spirit. Chief among these they count that of the primacy of jurisdiction granted to Peter and to his successors in the See of Rome. There are actually some, though few, who grant to the Roman Pontiff a primacy of honor and even a certain power or jurisdiction; this, however, they consider to arise not from the divine law but merely from the consent of the faithful. Others, again, even go so far as to desire the Pontiff himself to preside over their mixed assemblies. For the rest, while you may hear many non-Catholics loudly preaching brotherly communion in Jesus Christ, yet not one will you find to whom it even occurs with devout submission to obey the Vicar of Jesus Christ in his capacity of teacher or ruler. Meanwhile they assert their readiness to treat with the Church of Rome, but on equal terms, as equals with an equal. But even if they could so treat, there seems little doubt that they would do so only on condition that no pact into which they might enter should compel them to retract those opinions which still keep them outside the one fold of Christ. "This being so, it is clear that the Apostolic See can by no means take part in these assemblies. nor is it in any way lawful for Catholics to give to such enterprises their encouragement or support. If they did so, they would be giving countenance to a false Christianity quite alien to the one Church of Christ. Shall we commit the iniquity of suffering the truth, the truth revealed by God, to be made a subject for compromise? For it is indeed a question of defending revealed truth. Jesus Christ sent His Apostles into the whole world to declare the faith of the Gospel to every nation, and, to save them from error, He willed that the Holy Ghost should first teach them all truth. Has this doctrine, then, disappeared, or at any time been obscured, in the Church of which God Himself is the ruler and guardian? Our Redeemer plainly said that His Gospel was intended not only for the apostolic age but for all time. Can the object of faith, then, have become in the process of time so dim and uncertain that today we must tolerate contradictory opinions? If this were so, then we should have to admit that the coming of the Holy Ghost upon the Apostles, the perpetual indwelling of the same Spirit in the Church, nay, the very preaching of Jesus Christ, have centuries ago lost their efficacy and value. To affirm this would be blasphemy. 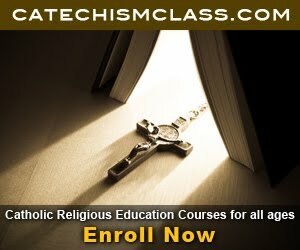 Much more information on the basics of Catholicism can be found at Fish Eaters. 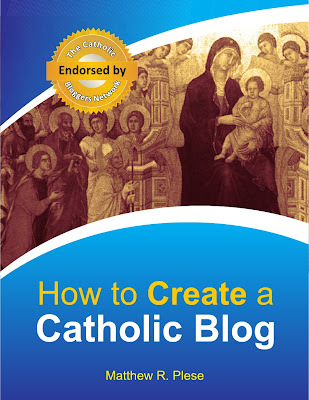 For some articles on Catholic beliefs that I have written, see my sidebar under the title "Catholic Categories". I. On the sole and universal salvific mediation of Jesus Christ. 1. It must be firmly believed that Jesus Christ, the Son of God made man, crucified and risen, is the sole and universal mediator of salvation for all humanity. 2. It must be firmly believed that Jesus of Nazareth, Son of Man and only Savior of the world, is the Son and Word of the Father. For the unity of the divine plan of salvation centered in Jesus Christ, it must also be held that the salvific action of the Word is accomplished in and through Jesus Christ, the Incarnate Son of the Father, as mediator of salvation for all humanity. It is therefore contrary to the Catholic faith not only to posit a separation between the Word and Jesus, or between the Word's salvific activity and that of Jesus, but also to maintain that there is a salvific activity of the Word as such in his divinity, independent of the humanity of the Incarnate Word. II. On the unicity and completeness of revelation of Jesus Christ. 3. It must be firmly believed that Jesus Christ is the mediator and fulfillment and the completeness of revelation. It is therefore contrary to the Catholic faith to maintain that revelation in Jesus Christ (or the revelation of Jesus Christ) is limited, incomplete or imperfect. Moreover, although full knowledge of divine revelation will be had only on the day of the Lord's coming in glory, the historical revelation of Jesus Christ offers everything necessary for man's salvation and has no need of completion by other religions. 4. It is consistent with Catholic doctrine to hold that the seeds of truth and goodness that exist in other religions are a certain participation in truths contained in the revelation of or in Jesus Christ. However, it is erroneous to hold that such elements of truth and goodness, or some of them, do not derive ultimately from the source-mediation of Jesus Christ. 5. The Church's faith teaches that the Holy Spirit, working after the resurrection of Jesus Christ, is always the Spirit of Christ sent by the Father, who works in a salvific way in Christians as well as non-Christians. It is therefore contrary to the Catholic faith to hold that the salvific action of the Holy Spirit extends beyond the one universal salvific economy of the Incarnate Word. IV. On the orientation of all human beings to the Church. 6.It must be firmly believed that the Church is sign and instrument of salvation for all people. It is contrary to the Catholic faith to consider the different religions of the world as ways of salvation complementary to the Church. 7. According to Catholic doctrine, the followers of other religions are oriented to the Church and are all called to become part of her. V. On the value and salvific function of the religious traditions. 8. In accordance with Catholic doctrine, it must be held that "whatever the Spirit brings about in human hearts and in the history of peoples, in cultures and religions, serves as a preparation for the Gospel" (cf. Dogmatic Constitution Lumen Gentium, 16). 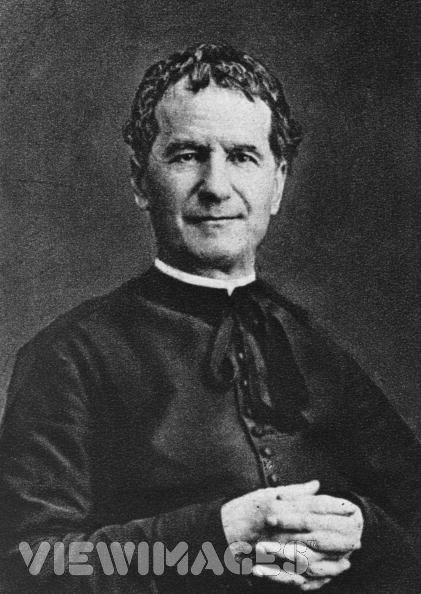 It is therefore legitimate to maintain that the Holy Spirit accomplishes salvation in non-Christians also through those elements of truth and goodness present in the various religions; however to hold that these religions, considered as such, are ways of salvation, has no foundation in Catholic theology, also because they contain omissions, insufficiencies and errors regarding fundamental truths about God, man and the world. Furthermore, the fact that elements of truth and goodness present in the various world religions may prepare peoples and cultures to receive the saving event of Jesus Christ does not imply that the sacred texts of these religions can be considered as complementary to the Old Testament, which is the immediate preparation for the Christ event. Let us pray and work towards unity - that all people will be members of the one, true Church that Jesus Christ established for the salvation of the world - the Catholic Church.Please read the prayer of Jesus for Christian Unity from The Gospel of John, Chapter 17. "O Everlasting Love, Jesus, who have enclosed Yourself in the Host, and therein hide Your divinity and conceal Your beauty, You do this in order to give Yourself, whole and entire, to my soul"
With tomorrow being the Feastday of St. Agnes, the Holy Father carried out the traditional blessing of two lambs. For those that are concerned, the lambs in the picture are perfectly healthly and safely wrapped in blankets and roses. St. Peter's Helper has a great article on the Blessing of Lambs for the Feast of St. Anges. May they all be on as you, Father, are in me, and I in you, so that the world may come to believe that you have sent me. V. And it is upon this rock that I will build my Church. Let us pray: Lord Jesus Christ, who said to your apostles: I leave peace with you; it is my own peace that I give you; look not upon our sins but upon your Church's faith, and graciously grant her peace and unity in accordance with your will. You who live and reign forever and ever. Ut omnes unum sint, sicut tu Pater in me et ego in te; ut mundus credat quia tu me misita. V. Et super hanc petram dificabo ecclesiam meam. Oremus: Domine Iesu Christe, qui dixisti Apostolis tuis: pacem relinquo vobis, pacem mean do vobis ne rspicias peccata nostra, sed fidem Ecclesie tuae, eamque secundum voluntatem tuam pacificate et coadunare digneris. Qui vivis et regnas in saecula saeculorum. We believe in the God of All Creation, that is to say, I believe in the One, Triune God, One God in Three Divine Persons, God the Father, God the Son and God the Holy Spirit. The same God Today, Yesterday and Forever, whose nature is always to have mercy. We believe in the One, Holy, Catholic and Apostolic Church as she exists in Communion with the Bishop of Rome, who is the Successor of St. Peter the Apostle and first Pope. We believe all that is stated in the Nicene Creed. 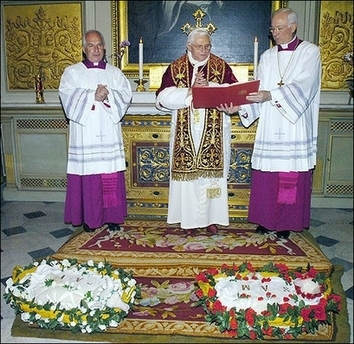 We believe that the Catholic Church, in Communion with the Bishop of Rome (the Pope) is the Church that was founded directly by Jesus Christ nearly 2000 years ago, and is the Church that compiled and Canonized the Bible and that members of this Church were the authors of the New Testament, inspired by God the Holy Spirit. We believe that I may unite my emotional and physical afflictions, sorrows and sufferings to the sufferings of Christ Crucified for the sake of the Whole Church, and I believe that our personal sufferings are great means of personal Sanctification. We believe in the Queenship, Divine Motherhood, Perpetual Virginity and Intercession of the Theotokos also known as the Blessed Virgin Mary and I believe that she can and does hear our prayers and can pray for us to her Divine Son, Jesus Christ who is God. The Bible teaches us that we must intercede for each other based on the Mediatorship of Jesus Christ (1 Timothy 2:1-5), the Bible teaches us that the Prayers of the Righteous are powerful (James 5:16) and the Bible teaches us that the Saints and Angels in Heaven offer our prayers to God in the form of incense (Rev. 5:8, Rev. 8:1-4), and the Bible has examples of prayer to the Angels and Hosts of Heaven (Psalm 103:20-21, Psalm 148:1-2). I believe that the Most Holy Ever Virgin Mary, Mother of God is an excellent person to go to for intercessory prayer. Jesus teaches us that through Him, we may have Eternal Life. Based on this, We believe that the Saints in Heaven are very much alive, can hear our prayers and do intercede for us. Some claim that praying to Mary and the Saints and Angels means that we are worshipping them. This is not so. Prayer in itself is not an act of worship. The word "Prayer" means "Request." So when we pray, we are making a request, and in the case of prayer to Saints, we are requesting THEIR intercession (1 Timothy 2:1-5) to God on our behalves based on the Mediatorship of Jesus Christ. We believe that Christ is truly present in the Eucharist; the source and summit of our Catholic faith. Protestants reading this may say that the Passover isn't finished until Calvary, I would suggest that Calvary is really begun in the Upper Room with the Eucharist. When does Jesus' sacrifice really begin? Well, He insists on the fact that His life is not being taken away from Him. He is laying it down. Now in the trial, in the passion, it's being taken away; but in the Upper Room, prior to all of that, Jesus lays it down. He says, "This is my body. This cup is the blood of the New Covenant." Christ could not have used clearer, more explicit words than "This is My body." He did not say, "This is a sign of My body," or "This represents My body," but, "This is My body." 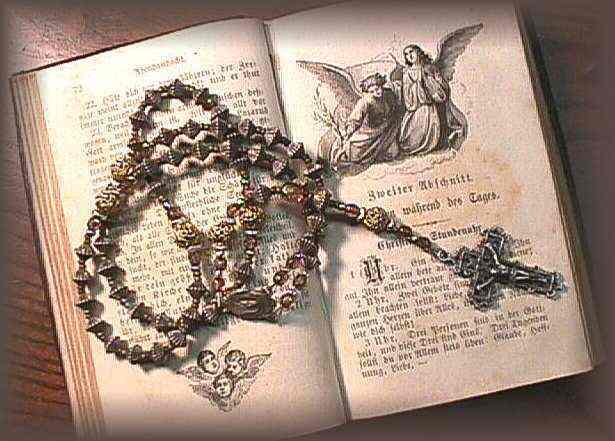 I together with 1 billion Catholics take Christ at His word because He is the omnipotent God. 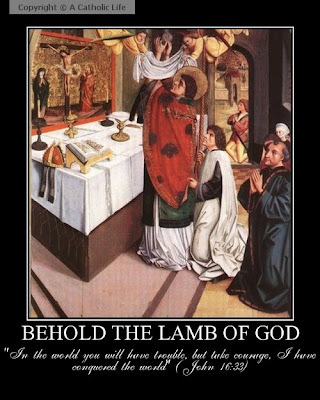 On His word we know that the Holy Eucharist is the the body and blood of Christ. To reiterate, We believe in the Catholic Church and ALL that she teaches. This is the Faith handed on to us once and for all by Jesus Christ and His Apostles. It's Thursday again and that means this evening will be spent in RCIA. At the beginning of the year, when people poke their heads through the door and ask, "Is this RCIA? ", you have no idea what compelled them to come. Then gradually through the year, their stories come out. Some during class and others outside of class. Most come not out of any earth-shattering theological conviction, but out of a nascent desire to follow Christ. Others come in spite of tremendous opposition, and occasionally, that opposition might even be dangerous. Please consider praying for the RCIA program at your church, for those that coordinate it and, though they may be unknown to you, for each person in the process. On Monday, a gentleman approached me after morning Mass and said that he had been praying for our parish's RCIA everyday. It meant a great deal to me. 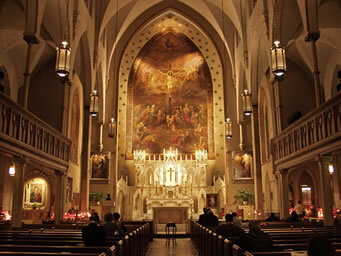 This is a beautiful church, so I had to share this photo of the Church of the Holy Innocents from New York, USA. I found this story posted on A Catholic Mom in Hawaii, and I was very pleased to read about it. With 600,000 Satanists predicted to be in Italy, it is great news that Italian priests are going out into the streets to protect the Lord's flock. For a priest is called to lay down his life for the Flock, and that is what these priests are doing. The devil is real. He is not a metaphor but a real fallen angel seeking to destroy the Lord's flock. We must resist Him always in this life. For Jesus came to destroy the words of the devil (1 John 3:8). And while it remains a mystery while he is allowed to remain (CCC 395), we must fight the good fight and continue living for God. 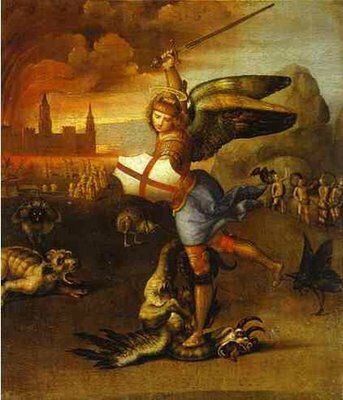 Let us frequently say the Prayer to St. Michael the Archangel. The clerics have been seconded to the Squadra Anti Sette (SAS) anti-sect squad by the Vatican after Church officials became concerned about the number of churches being desecrated by Satanists. In recent months there have also been a string of murders that have been linked to devil worship. One of the Vatican's leading experts on Satanism and the occult, Don Oreste Benzi, has been brought in to liaise with police. He told The Sunday Telegraph that the natural curiosity of young people meant they were particularly attracted to the occult, and drugs were also used to influence and manipulate them. St. Michael the Archangel, ora pro nobis! I have two very difficult classes this semester, which are taking up more time than I originally thought. However, everything is going very well so far. So, please forgive the delay in the Saint for the Year Devotion as well as the lack of posts. "We have to give until it hurts. We need to give from the resources we would like to keep for ourselves. We need to give to the point of sacrificing. We must give something that we find hard to give up." 2. In virtue of power conceded by the law, the regulation of the liturgy within certain defined limits belongs also to various kinds of competent territorial bodies of bishops legitimately established....3. 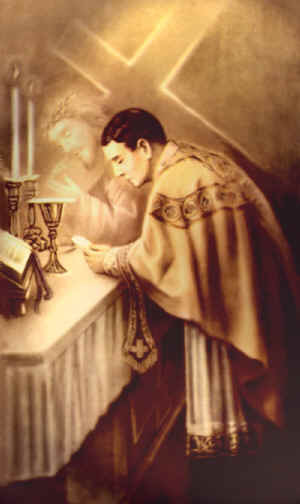 Therefore, no other person, even if he be a priest, may add, remove, or change anything in the liturgy on his own authority. 36.1. Particular law remaining in force, the use of the Latin language is to be preserved in the Latin rites. 54....steps should be taken so that the faithful may also be able to say or to sing together in Latin those parts of the Ordinary of the Mass which pertain to them. 115....Composers and singers, especially boys, must also be given a genuine liturgical training. 121. The texts intended to be sung must always be in conformity with Catholic doctrine; indeed they should be drawn chiefly from Holy Scripture and from liturgical sources. 124....Let bishops carefully remove from the house of God and from other sacred places those works of artists which are repugnant to faith, morals, and Christian piety, and which offend true religious sense either by depraved forms or by lack of artistic worth, mediocrity and pretense. "Then Sr. Mary Joseph, leaning back in the office chair, lifted the brown scapular of her brown woolen habit and explained to me that the summer habit weighed 20 pounds and the winter habit weighed 30 pounds. Then the front doorbell buzzed, when she stood up to answer the door, I noticed that she was very stooped over, I noticed the weight of the habit, and that the tunic with its long sleeves, the long black veil and brown scapular rustled as she answered the bell. This bride of Christ, a special daughter of the Blessed Virgin, returned to me and said: 'And I wear this 20 pounds of wool in the summer as penance for those in the world who dress immodestly.' It was amoment of grace for me. I remember this scene often." I beseech you, my brothers, to be ever on your guard against the habit of swearing and blaspheming. If a slave dare to pronounce the name of his master, he does it but seldom, and then only with respect; therefore is it not a shocking impiety to speak with contempt and irreverence of the name of the Master of angels and seraphim? People handle the book of the Gospel with a religious fear, and then only with clean hands, and yet your rash tongue would inconsiderately profane the name of the Divine Author of the Gospel. Would you wish to know with what respect, fear, and wonder the choirs of the angels pronounce the adorable name? Listen to the prophet Isaiah: " I saw," says Isaiah, "the Lord sitting upon a throne high and elevated; upon it stood the seraphim, who cried one to another and said, Holy, holy, holy, the Lord God of hosts, all the earth is full of His glory." See with what terror they are seized, even while they praise and glorify Him. As for you, my brethren, you know how cold and indifferent are the prayers you say, and you know how frequently you blaspheme a name so majestic, so sacred, and how you try to make excuses for the bad habit you have contracted. It is easy, yes, I say, it is easy, with a little care, attention, and reflection, to leave off this vicious habit. Since we have fallen, my brethren, into this sin of blasphemy, I conjure you, in the name of our Lord, to rebuke openly these blasphemers. When you meet with such who publicly sin in this respect, correct them by word of mouth, and, if necessary, by your strong arm. Let these shameless swearers be covered with confusion. You could not employ your hand to a holier work. And if you are given into custody, go boldly before the magistrate, and say in your defense that you have avenged a blasphemy. For if a person is punished for speaking contemptuously of a prince, is it not reasonable to suppose that a person who speaks irreverently of God should be sentenced to a severer punishment? It is a public crime, a common injury which all the world ought to condemn. Let the Jews and infidels see that our magistrates are Christians, and that they will not allow those to go unpunished who insult and outrage their Master. Do you remember that it was a false oath that overturned the houses, temples, and walls of Jerusalem, and from a superb city it became a mass of ruins? Neither the sacred vessels nor the sanctuary could stay the vengeance of a God justly angered against a violater of His word. Sedecias did not receive a more favored treatment than Jerusalem. Flight did not save him from his enemies. This prince, escaping secretly, was pursued and taken by the Assyrians, who led him to their king. The king, after asking him the reason of his perfidy, not only caused his children to be killed, but deprived him of his sight, and sent him back to Babylon, loaded with iron chains. Would you know the reason why? It was that the barbarians and Jews who inhabited the country adjoining Persia should know, by this terrible example, that the breach of an oath is punishable. Each year in the Traditional Liturgy of the Church (1962 Roman Catholic Missal) on the 2nd Sunday after the Epiphany, the Church recalls the Wedding at Cana and Jesus' first public miracle, namely the changing of water into wine at the Wedding Feast of Cana. And the third day, there was a marriage in Cana of Galilee: and the mother of Jesus was there. 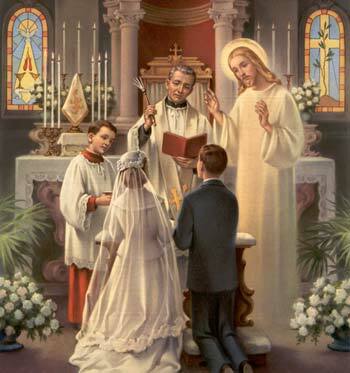 And Jesus also was invited, and his disciples, to the marriage. And the wine failing, the mother of Jesus saith to him: They have no wine. And Jesus saith to her: Woman, what is that to me and to thee? my hour is not yet come. His mother saith to the waiters: Whatsoever he shall say to you, do ye. Now there were set there six waterpots of stone, according to the manner of the purifying of the Jews, containing two or three measures apiece. Jesus saith to them: Fill the waterpots with water. And they filled them up to the brim. And Jesus saith to them: Draw out now, and carry to the chief steward of the feast. And they carried it. And when the chief steward had tasted the water made wine, and knew not whence it was, but the waiters knew who had drawn the water; the chief steward calleth the bridegroom, And saith to him: Every man at first setteth forth good wine, and when men have well drunk, then that which is worse. But thou hast kept the good wine until now. On January 6th of each year the Church celebrates the Epiphany of the Lord, the arrival of the Magi to the Infant Jesus. But that is the merely the first of three epiphany moments, which are all equally remembered in the Traditional Liturgy on the Feast of the Epiphany. Today in the Gospel we focus once more on one of the three primary manifestations of Christ, namely the Miracle in Cana. The other manifestation is recalled yearly as well on January 13rd (Traditional 1962 Liturgy), and this manifestation is the Baptism of Jesus in the River Jordan, at which God the Father calls out from Heaven: "This is my Beloved Son in whom I am well pleased." We notice that it is Mary who intervenes for the people and says to Jesus, “They have no wine.” In the same regards, Mary intervenes for anyone who asks for her prayers. While there certainly is only one mediator between God and man, Mary is the Mother of God and an intercessor for mankind.St. Albert the Great wrote in Mary, Canice, p. 36: "Immediately next to being God is being the Mother of God." She held a unique role in salvation's history. Jesus Christ redeemed us, but Mary remains the Mother of Jesus and our spiritual mother. She is not equal to God but rather the most glorious person created by God because of her humility, trust in God, and above all, her Immaculate Conception. Cannon Francis Ripley write in This is the Faith pg. 367: "Because of the inexpressible dignity that is hers, the Catholic Church has from the beginning given Mary the highest form of honor below that reserved for God alone. The Church's practice has always reflected her belief that, provided Mary is not "adored" (which is the unique honor given to God alone), she cannot be honored to excess." Looking at John 19:27, Jesus says to St. John: "Behold thy mother." Is she literally the mother of John? No, of course not, but she is his spiritual mother - a symbol of Mary becoming the mother of the Faithful. And there should be no objection to her being our spiritual mother. The Gospel account continues with Jesus responding to Mary: “Woman, what is that to me and to thee? my hour is not yet come" Now here is where the objections come. Most protestants will claim that the usage of woman illustrates the unimportance of Mary. This is completely false! Look to Genesis 3:15 which states, “I will put enmity between you [the serpent] and the woman, and between your offspring and hers; He will strike at your head, while you strike at his heel”. This “enmity” in Genesis 3:15 is not between the man and the serpent but the woman and the serpent. Church teachings are that this is in reference to Mary, the one to come and destroy the serpent because of allowing Our Lord to take flesh within her. Not sure, yet? Look to Revelations 12:1, which states, "A great sign appeared in the sky, a woman clothed with the sun, with the moon under her feet, and on her head a crown of twelve stars." But, who is this woman in the Book of Revelations? It is Mary, as the Book of Revelations states, the woman gives "...birth to a son, a male child, destined to rule all the nations with an iron rod" (Revelations 12:5). This child was Jesus Christ, and the woman is Mary! So, when we look back at the Wedding Feast of Cana, Jesus is alluding to Mary as the woman promised in Genesis and spoken in Revelations. This is honoring her! 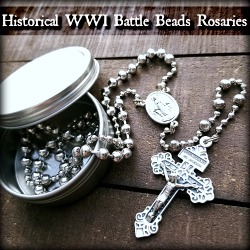 Satan is not in a war against Jesus Christ - he is fighting against Mary and us! Satan is nothing compared to the God. He hates us because we have the chance to enter Heaven, but Satan fell from Heaven forever by his rebellion. Satan wants to destroy our salvation, so he hates us all. As Genesis states, the entity is between the serpent and the Woman. All of this theological mystery is part of Jesus' words in the Wedding Feast of Cana. One can not assume that calling Mary woman is inappropriate or showing of disrespect by applying present-day practices (namely, not calling our own mothers woman) to a different culture from 2,000 years ago. And, then Jesus Christ says, "My hour is not yet come." What is his hour? His hour is the Cross - the literal three hours that He would spend on the Cross for the world's redemption. As John 12:23 states, "The hour has come for the Son of man to be glorified." 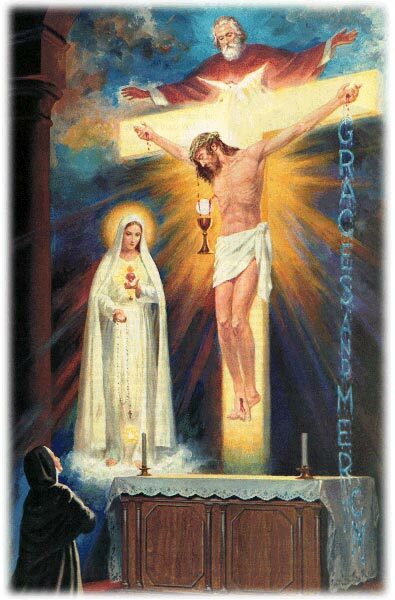 So, when Jesus says to His Mother that the Hour has not yet come, He is saying that if He performs a miracle then the road to the Cross has begun! But, Jesus performs the miracle and embarks on a journey to the Cross for love of us. Let us walk with Him in peace and joy this Epiphany Season and all year long. 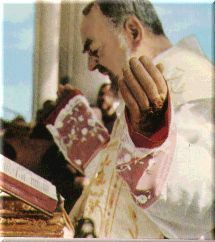 "The man who receives Holy Communion loses himself in God like a drop of water in the ocean: It's impossible to separate them anymore . . . . In these vast depths of love, there's enough to lose yourself for eternity"
On the Care of the Tongue: Its importance and difficulty. What is to be observed and avoided in conversation. How we are to bear the evil tongues of others. IT IS A matter of as great importance to guard the tongue as it is the pupil of the eye, because "Death and life are in the power of the tongue." (Prov. 18:21). He who cannot govern his tongue is like a city without walls, which is exposed on all sides. Without the grace of God, however, it is next to an impossibility to tame it. Man tames the lion, the bull and the bear, but his tongue he cannot tame. Human nature loves to talk much, as it rejoices to give immediate expression to its desires and conceptions. Moreover, the tongue is fixed near the brain, as the mouth is near the faculty of thought, in order that whatsoever the mind thinks may be quickly conveyed to the organ of speech and published in words. Nature itself has taught you how necessary it is to guard the tongue, since it has placed a double barrier (in the teeth and the lips) before this member. But as the fragrance of the sweet ointment evaporates if the box in which it is kept be left open, so all the vigor of the mind is dissipated when the mouth is not closed. That man forgets himself who is not always mindful of guarding his tongue. Be prudent in every conversation, suppressing that immoderate inclination which rashly hurries most people on to pass sentence upon their neighbor without due examination and deference to the case in question. Flee far from duplicity and deception, and without any ambiguity or equivocation deliver the pure sentiments of your mind. God has given you the faculty of speech that you may truly and candidly announce things as they really are. Before you speak, consult your conscience—as to whether you be influenced by any evil passion—nor should you permit your tongue to say a word until that influence cease; otherwise, you shall say many things of which you shall afterwards have to repent. You may easily keep silence if you allow no passion to disturb your heart and if you preserve your soul tranquil and serene. Your discourse and your mind ought to be stamped with the same character. If your mind be sound, temperate and composed, your discourse also will be prudent and temperate. If the former be corrupted, the latter will breathe corruption. It is language that reveals to us the character of him who speaks. Your conversation ought not to be of an idle nature. You ought to be as particular in the choice of your words as you are in that of your food. You examine the bread that you eat; why not do the same with the words you speak, which have often raised greater disturbances in your house than your food has caused in your stomach. Accustom yourself to speak much with yourself and little with others. Wise men have often regretted having spoken, but never having kept silence. Those animals are esteemed more sagacious whose voice is least heard. Talkativeness is the vice of children, and of women in whom reason is not strong. Any man who speaks nothing but vain and useless words has no virtue. If you love God and your salvation, your discourse will be on God, virtue and perfection. Charity is a stranger to falsehood, nor can it disguise itself. Everyone is immersed in the things which he loves, and these form the subject of his conversation. Hence you speak less willingly of divine things because you have not as yet arisen from the dross of your vices. I must add, you ought to read and meditate a little, at least on subjects regarding your salvation. How could matter on this fail you if you wish to speak to yourself? "For out of the abundance of the heart the mouth speaketh." (Matt. 12:34). Almost every discourse among men turns on the life, morals and pursuits of others; and there are almost as many judges passing sentence upon each one as there are inhabitants in his city. Scarcely does anyone look at home. We are for the most part near-sighted with regard to our own faults, but in discerning those of others, our vision is very good. We throw wide open our doors to receive reproaches against our neighbor, but hardly do we leave a chink open to hear anything in his praise. It behooves us, in places where this vice is more common, to be more careful in avoiding it. You have plenty to do with your own vices—find fault with these and correct them. Do not divulge your own secrets, or those of others which you are obliged to conceal. Many have fallen into great disputes because they revealed their secrets to imprudent persons to whom they ought not to have confided them. Usually, to tell a thing to one person is the same as telling it to many. A word easily flies from one to another, and from these to all. This arises from the extent of discourse, to which many people fix no just bounds. The pleasure which one feels in conversation insensibly draws him on, and like drunkenness, so occupies the mind that there is no secret so hidden and sacred which may not travel abroad and become public. A man reveals to you his secrets; you in return, having received a pledge of confidence, communicate yours to him. But you perhaps may keep these secrets, while he tells everyone he meets the secret things he has heard, so that everyone knows, under cover of a secret, that of which all were ignorant in public. You may well say that tongues take wings to fly privately to the ears of all, until the secret extends far on all sides and becomes a report. Whatsoever evil is under Heaven generally owes its origin or advancement to the tongue; therefore, make a balance for your words and a bridle for your mouth. You ought to say nothing of which it would be better to keep a profound silence. Stinginess in words is more praiseworthy than that in money. The man who scatters his money benefits others, while he injures himself; he who lavishes his words injures both himself and others. The person who knows how to hear much and say little approaches near to the Divinity. Nothing can be secure from the darts of the tongue: It is not arrested by the power of kings nor by the virtue of saints; the one needs not dread the sword, and the other cannot fear censure, yet neither can hide from calumny. Christ Himself, when living among men, did not escape the scourge of the tongue. Imitate Jesus and the Saints in their example of patience. Detraction is both a spur to urge men to the practice of virtue, and a bridle to hold them in the right way. There is no enemy among the vices more powerful than censure. When anyone speaks ill of you, he teaches you what you ought to avoid. Do you wish to escape the darts of the envenomed tongue? Disdain them. If you observe silence, you shall receive no wound. Esteeming much the judgment of the good, you need not fear the insolence of the calumniator. It concerns you but little what others may think of you; in your own conscience you have a more certain and incorruptible witness. Interrogate your conscience and believe it. What can be more unworthy of you than to rest your character on the saying of the unwise and to submit it to the judgment of another? It is necessary that you should be good, let others say what they will of you, as if gold or emerald should say, "Whatsoever they may think, it behooves me to be what I am by nature and to preserve my color." If anyone should say injurious words to the limpid fountain, shall it therefore cease to pour out pure water? And if a person should throw dirt into it, does it not presently clear itself, dissipating the filthy matter? Thus, neither ought you to disturb the calmness of your mind, although the wicked should calumniate and tear you to pieces. To be disturbed at every rumor is to have but little regard for oneself. Children strike with their little hands the mouth of their father; the infant pulls the hair of its mother, gnawing her bosom, tearing her cheeks and spitting on them, and we call none of these things an injury, because he who does them is incapable of conceiving such an act. Do you also entertain the same sentiments for those who calumniate you as parents cherish for their children? If once you let yourself be moved by anger on account of an injury, becoming weak-minded thereby, you honor him who is the cause of it. It is necessary, then, that you should have the glory of being admired by him from whom you could bear to suffer disdain. But this is the vice of a base soul and a little mind. You shall always be unhappy if you imagine yourself despised. Created by Paper Napkin to encourage readers who are too shy to leave a comment to speak up, De-Lurker Day has been extended to an entire week. That way everyone has a chance to work up the courage to speak up. And this is National De-Lurker Week! So please just leave me a line or so in the comment box below. How long have you been reading my blog? Or what is your favorite book, movie, or TV show? Or what is the weather like today where you are? I'm not picky. Someone that I know is having a very quick surgical procedure done tomorrow. I would appreciate your prayers for this person - that everything will go well. Also, the man that used to serve as a deacon for a parish I went to has died. Please say a prayer for his soul. 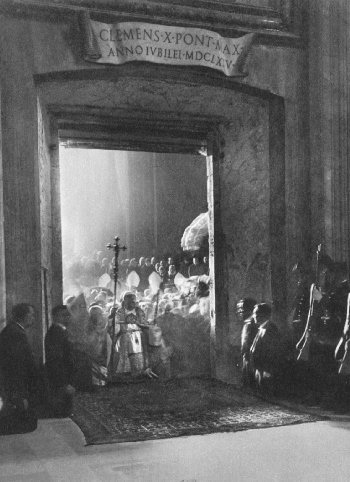 His name was Deacon John S.
Above is an image of Pope Pius XI opening the Holy Door in St. Peter's in 1925. Ever since reading this comment by Mother Teresa around the time that I was confirmed, I have decided to only receive Holy Communion on the tongue. 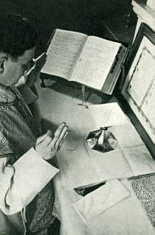 The priests hands are the only ones that should touch the Eucharist and sacred vessels like the chalice. 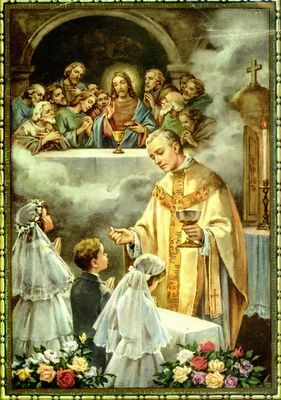 "Out of reverence towards this sacrament, nothing touches it, but what is consecrated; hence the corporal and the chalice are consecrated, and likewise the priest's hands, for touching this sacrament. Hence it is not lawful for anyone else to touch it except from necessity, for instance, if it were to fall upon the ground, or else in some other case of urgency" (Summa Theologica, III, Q. 82, Art. 3). 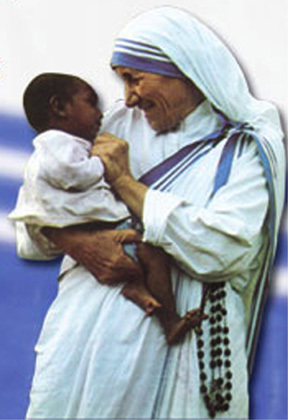 When Mother Teresa was asked by Fr. George Rutler, "What do you think is the worst problem in the world today?" she replied without a moment’s hesitation: "Wherever I go in the whole world, the thing that makes me the saddest is watching people receive Communion-in-the-hand." "Don’t let the many snares of this infernal beast frighten you. Jesus, who is always with you, and who will fight with and for you, will never permit you to be tricked and overcome" (St. Padre Pio). "Many souls go to Hell because there are none to sacrifice themselves and to pray for them" (Our Lady of Fatima). Reminder: Did you pray your Morning Offering today? 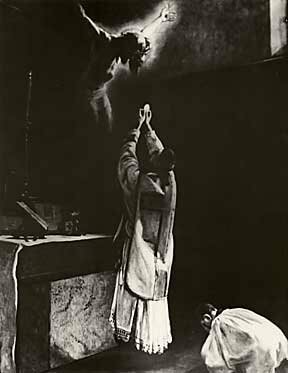 Image Source: Blessed Giles of Assisi levitating. Bishop Patrick J. McGrath has decreed the canonical establishment of the Oratory of the Chapel of Our Mother of Perpetual Help on 1298 Homestead Road, Santa Clara, California for the Catholic faithful in the Diocese of San Jose who are attached to the rituals in use in 1962 effective January 1, 2007. 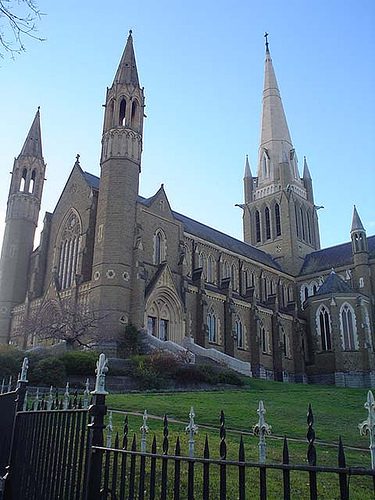 The Oratory is entrusted to the pastoral care of the Institute of Christ the King Sovereign Priest. Bishop McGrath formally welcomes the Institute of Christ the King Sovereign Priest into the Diocese of San Jose. Let us pray: Lord Jesus Christ, who said to your apostles: I leave peace with you; it is my own pace that I give you; look not upon our sins but upon your Church's faith, and graciously grant her peace and unity in accordance with your will. You who live and reign forever and ever. V. Oremus: Domine Iesu Christe, qui dixisti Apostolis tuis: pacem relinquo vobis, pacem mean do vobis ne rspicias peccata nostra, sed fidem Ecclesie tuae, eamque secundum voluntatem tuam pacificate et coadunare digneris. Qui vivis et regnas in saecula saeculorum. I am continuing to get Saint for the Year Requests. It is amazing! There have been exactly 708 requests already for 2007! I am working extremely hard to email people back, and most people do let me know they receive their message. If you do not give me an email address or a blog url, then please see my Results Page to find your saint. Then comment on that page giving your name/screenname to let me know that you have received the results. If you have requested a saint over 2 weeks ago but have not yet received a reply, then please email me again. I have a list of requests I am still trying to take care of, though, and they are from the past two weeks. Today the Church celebrates the Baptism of the Lord, recalling the glorious event in the River Jordan. 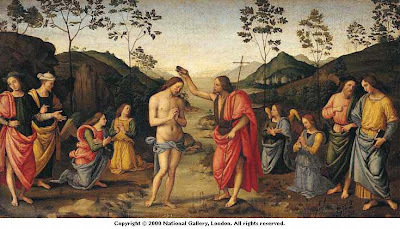 For more information on this feast as well as on Baptism, see my post from last year. Almighty, eternal God, when the Spirit descended upon Jesus at his baptism in the Jordan, you revealed him as your own beloved Son. Keep us, your children born of water and the Spirit, faithful to our calling. We ask this through our Lord Jesus Christ, your Son, who lives and reigns with you and the Holy Spirit, one God, for ever and ever. Can God be known by reason alone?